Yes, today, otra vez, April 14th is Black Day… The day of darkness. The day as dark as black. We otaku are colonized by the darkness called 3-D. The colonized man is an envious man. We envy people who can spend a content life in 3-D, i.e., riajū(リア充). We envy people who can enjoy Valentine’s Day (Feb 14th) and White Day (Mar 14th), their life must be sweet like chocolate, dulce como chocolate. So, we’re jealous. The colonized man is also a jealous man. Therefore, let us eat jajanmyeong! Let us celebrate Black Day! Down with bitterness and absurdity of 3-D life! Yeah, it’s South Korean tradition. You went to Korea and ate original jajamyeong? Very cool! Though you’re married, you gonna get one for Black Day? That’s awesome! At least, you are cheering us up by doing that, which is very compassionate of you. Thank you! Nah.. bitter meaning about not getting anything back.. I don’t believe any of my friends who I gave giri choco yet to, has delivered. If they remember, then they’re all late. ^_^ Hmm.. never really had Korean cuisine, other than dumplings, kimchee, and bimbop. Have to remember to see if I can find this dish in K-town then. Yeah, I know, just word play. So, you did actually give giri then. That’s cool. I never received giri in high school. Didn’t even have female friends who could hang out. Yes, I’m sure there’s one in the East coast. Ahh, how sad…people don’t observe White Day in America, so probably that’s why your dear friends forgot about it. I’m sure if they’re in Japan, whether they like it or not, they will hear about White Day everyday around that season, so they can’t forget about it. Awesome, I’m glad you liked jajamyeong!!! Yeah! I find that in the United States, Valentine is a veerryy overrated holiday for couples. Very true, however real life has me not being able to hang out with my friends as much. So. ^_^ Hmm.. I definitely wouldn’t mind trying that dish again. Yeah, I agree it’s overrated. It makes me want to hide away particularly on Valentine’s Day. Ah that’s too bad… Yeah, we got busy life. And especially in America and Japan, you’re seen as lazy if you don’t keep yourself busy. So, it’s kind of OCD that we make ourselves quite unavailable… We need more of yutori. Yeah, hurray to Black Day dish! 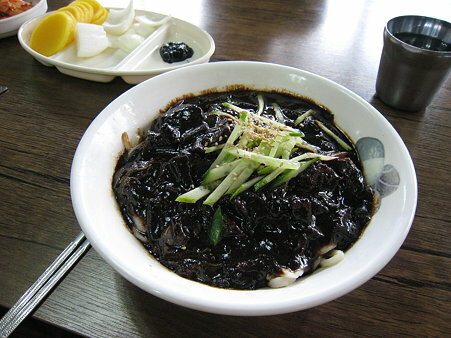 Black Day is a day when singles who didn’t get to have Valentine’s Day and White Day will gather and eat Korean black sauce noodle together to celebrate their singledom.